Kites were first introduced 3000 years ago in China. They were tied to bamboo pipes and were used in battles to scare away the enemy. As the kites flew in the air, wind whistled through the pipes and the shrilling sound emitted did the trick. The kite has come a long way since then. After having served various functions including helping the American Weather Bureau in forecasting the weather, the most important function of the kite, that of a recreational one was realised late, but since has proved to be the kite's mainstay. Pakistani Kites gives you a chance to indulge in Pakistan's favorite pastime. 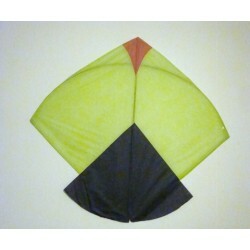 Please note that the color of the kites may vary from order to order. 95 Dollars 4 Piece Spool Manjha - Pakistan Fighter Kite Cutting Line. Pakistan Fighter Kite Cu..
Pakistani Kite Fighter Small 33" W x 28" T. Its Called Guda its 1 Tawa . ..